The Sunday morning session is a talk on breast cancer statistics and the mission of the ride by both doctors, which is to raise awareness for Asian breast cancer and its research. Dinner was at a Teochew Porridge stall which has the longest depth of any shophouse that I have stepped into! After dinner, it was route planning time for the next day. As we moved out from Chumphon, back on the highway, the initial suspicions about Philip’s bike came true when Seung noticed the rear wheel beginning to step sideways in the turns. Something was loose on the rear, and it was later confirmed by a mechanic that the rear wheel bearing was damaged. Bike was towed to a nearby small town called Bang Saphan to be repaired... 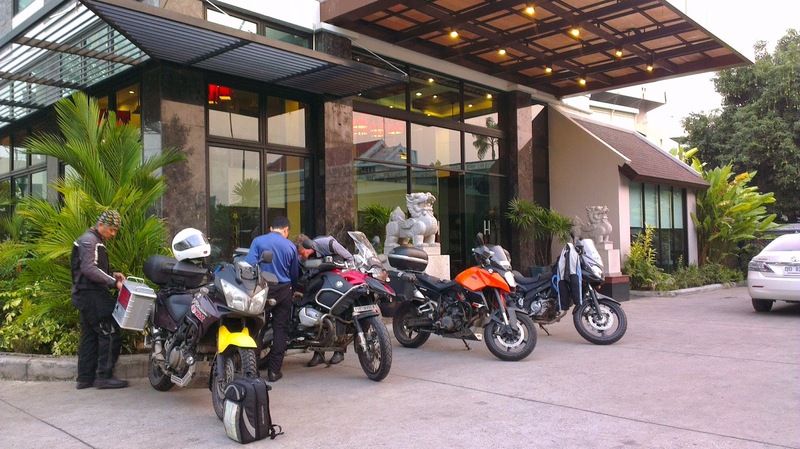 This contact was gotten after a call to Wan Azuar and Sumon, bikers from Malaysia & Thailand, always ready to help. Due to this set back, we had a 3 hour delay causing us to reduce the day’s distance to Cha’am. Stayed at Chez Nous Boutique Resort, a nice comfortable beach side resort with immaculate gardening, pristine housekeeping & friendly staff. Philip opted to give himself a break and so Bumblebee swung into action. We activated bike carry mode and Phil’s V-Strom 1000 was safely hitched onto the rear of the truck. It was full touring rhythm today, we had good cruising speed of 100-120kmh on the highway to Nakhon Sawan. Arrived at 4pm, a good 1.5 hours ahead of Bumblebee as it trudged along with the full load of five adults, luggage and a motorcycle sitting on the back of the tow hitch. Our place chosen for the night is an excellent stop over for road trippers called Bonito Chinos Hotel. It is just 100m from the turn off along the Superhighway and with eateries within walking distance for tired bikers / drivers. Bonus is the full breakfast spread which includes the sweet Thai pineapples and watermelons. Again, another full day of biking, on highway 1. Experienced epic heat of 41 degrees air temperature on the highway. The hot air blowing had an insane effect that no amount of cold drinks could take away. We stayed hydrated, breaking for iced coffee and water every hour at the much appreciated Cafe Amazon within the petrol stations.